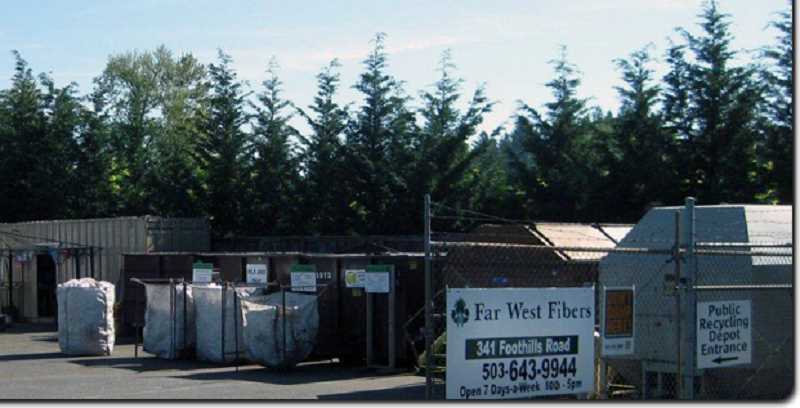 Far West Recycling has announced that it will close its Lake Oswego recycling yard in the Foothills District on Sept. 23. The site has been a popular place for local residents to drop off bulk recycling and items that can't be collected in curbside bins, such as scrap metal and old electronics. But in recent years, changes to the global recycling market have left the yard's operators struggling to keep up with rising costs. "This has been on the table for a long time," said Far West Outreach Manager Vinod Singh. "We like being part of the community, but we just can't afford it any more, essentially." Far West almost shuttered the yard two years ago. The company's 10-year lease on the property was about to expire, and officials didn't think they could commit to running the site for another decade, given its financial condition. But the operation was saved at the 11th hour when the company was able to negotiate a new month-to-month lease. Far West subsequently implemented a series of cost-saving measures at the site, such as using its own dumpsters and haulers rather than working with contractors. The company also added a $5 surcharge for all drop-offs at the Lake Oswego site, and officials said at the time that they hoped the combined changes would be able to close the gap. "We did everything we could to get the cost down," Far West President Keith Ristau said in 2016. "If everybody chipped in, we could probably break even, which is all we want." "It's cost, basically," Singh said. "Everything's going up. Freight's going up, the operational costs are rising, and the value of the materials which help offset it a little bit, those are going down and down." The value of many recycled materials has plummeted since China began to crack down on the permitted level of contamination in its recycling imports late last year. That's one of several factors that has caused the site to continue to operate at a loss each month, according to Singh. One example is paper. According to Lake Oswego Sustainability and Management Analyst Jenny Slepian, the site collects a lot of paper recycling, but the value of pulp recycled paper has "taken a nosedive" in the past year. The Lake Oswego yard is scheduled to close Sep. 23, in order to give Far West time to clear out the site before the end of the month. According to Singh, the site will keep operating at full capacity until then. The yard is open from 9 a.m.-5 p.m. seven days per week. "There's not a ramping down," he said. "It will be business as usual up until that date, then we'll just close the gate and spend the rest of the week putting (the site) back to its previous condition." Before the market changes began to be felt, the site accepted a wide variety of materials; 1-7 numbered plastic, mixed paper, cardboard, glass, aluminum, scrap metal and most electronic appliances, such as TVs and computers. But according to Slepian, some of those materials became restricted in the past year as the market continued to contract. "For a long time, they had been collecting all of the plastics that people couldn't recycle curbside. Then they narrowed it down to number 1 and 2 plastics, and then they just stopped overall," she said. "The list of things they were collecting had gotten so small, and it's a lot of stuff that people could take to Metro South for free." For residents in search of a new site for items that can't be put in curbside recycling bins, Slepian recommended the Metro South transfer station in Oregon City (2001 Washington St.), which can accept scrap metal, wood debris, electronics, motor oil and paint for free, and household hazardous waste for $5 for up to 35 gallons. The Dan Davis Recycling Yard on Willamette Falls Drive in West Linn also accepts yard debris, branches and wood waste — though the yard now falls under new management. S&H Landscape Supplies & Recycling, which is based out of Tualatin and took over the yard Aug. 20 in place of Recology. West Linn's Robinwood Station also has regular collection events; go to www.robinwoodstation.org to find out more. Electronics can also be taken to Goodwill, and paints can also go to Sherwin-Williams and Miller Paint, Slepian said. Additionally, a Tigard-based company called Agilyx (7904 S.W. Hunziker Road) will accept number 6 polystyrene, including Styrofoam, but not starch peanuts. Unfortunately, all other plastics that cannot be collected in curbside bins must now go into the trash, Slepian said.